An unnamed man navigates his past across distant oceans to the cold island of his family; the same man, working as an historian imagines and reconstructs the history and physical fabric of an 1882 gentleman farmer’s residence; a found manuscript discovered beneath the floor gives voice to an unidentified woman whose life was lived out in a cell at the rear of this residence. A spare narrative poem in three voices, Remembering a Place I’ve Never Been examines our relationship with the past, the construction of memory and history. 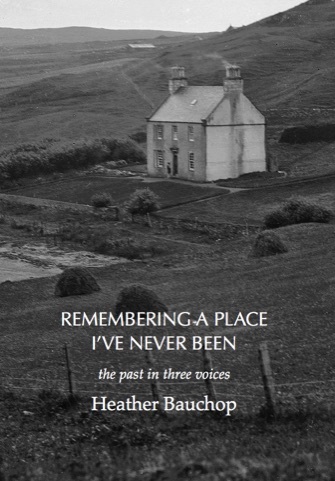 Born in San Francisco to lost Scottish parents who migrated to Palmerston North via Aberdeen in 1972, Heather Bauchop is a public historian who has written on iwi history and historic heritage. She now lives in Dunedin. Her short fiction and poetry have appeared in a number of journals, including Takahe (she was the winner of the 2016 Takahe short story competition with ‘Helicopter’) Headland, Alluvia and Poetry New Zealand, and in the 2017 anthology New Ink. In 2018, she was awarded a mentorship by the New Zealand Society of Authors. Remembering a Place I’ve Never Been is her first poetry collection. How can this grey sea be my blood? The cold wind my breath? in the leathery skin of time. fried in oatmeal for breakfast.